How secure is your business surveillance system? In today’s economy, where businesses are prone to terrorist activities, theft from outsiders and insiders, as well as advanced crime, it is necessary to install an effective surveillance system. Doing so will allow the insurance company to compensate you, as long as you can prove the thugs broke into your store and made away with your stock. Moreover, surveillance systems allow you to monitor your business while away. This is why it is important for business owners to consider high-level security surveillance systems. A common question a business owner is likely to ask is ‘what is the difference between Analog and IP Cameras?’. CCTV cameras are available in two types of cameras that are connected to your business surveillance system. These are the Internet Protocol (IP) Cameras as well as the traditional Analog Cameras. For more modern and up-to-date technology, you’ll want to go with IP cameras. In this article, we feature some top tips to factor in when purchasing either Analog CCTV cameras or IP CCTV cameras for your business. We will compare the two camera classifications under different categories. IP cameras come with a high resolution compared to analog cameras. The IP Cameras also shoot footage with a high megapixel rating compared to analog cameras. This means that IP cameras are a good choice if you want clear image quality. The analog cameras, on the other hand, offer grainy analog footage at a lower megapixel rating. In addition, IP cameras feature a larger field of vision compared to analog cameras. The IP cameras feature additional capabilities in terms of video analytics. This includes a mobile notification feature as well as automated recording whenever there is movement within its field of vision. This is a great feature to have when you want to know if there is someone moving within the business premises. The IP camera system can be configured to flag an alert whenever there is movement on company premises. You can also send this alert directly to your phone and view the recorded footage of the event. In addition to the analytics, IP cameras can also be connected to a network video recorder. This gives you additional benefits on top of the high-quality video that is recorded. It allows you to scale up these systems easily, a functionality that cannot be done with traditional DVRs. In general, IP cameras are more expensive compared to analog cameras. 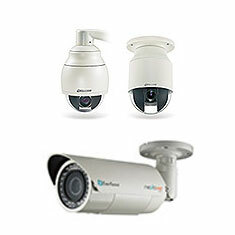 The total cost of the whole IP camera is slightly lower than the comparable analog cameras. This is based on its wider field of vision as well as the IP system being able to work with fewer, less cameras. IP cameras are thus superior to their analog counterparts. Modern businesses require a system that is connected to mobile devices which allows the business owner to monitor what is happening straight from their phone. This can be done even when out-of-state and comes with greater peace of mind for the business owner. If you’re deciding on the difference between Analog and IP Cameras for your business, contact ASAP Locksmith today and get a free quote over the phone for the best installation, repair, and replacement for these systems.